Russian Grandmaster Sergey Karjakin beat Van Wely’s second Sicilian Dragon of the 75th Tata Steel Chess Tournament 2013 in the last round. This gave Karjakin a joint third place along with Viswanathan Anand. Watch the post-game video comment, replay the game with Chess King, and read a full report on the last round at Chess Blog. 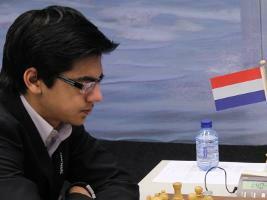 75th Tata Steel Chess 2013 R13: Anish Giri Lets Magnus Carlsen Escape with Draw! World No. 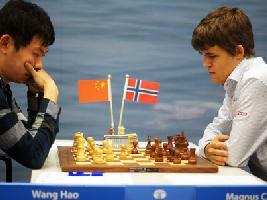 1 Magnus Carlsen had won the 75th edition of the Tata Steel Chess 2013 with a round to spare. However, the No. 1 was a bit lucky when his last-round opponent Anish Giri allowed a drawing combination after reaching a nearly winning position: After 28.Qa3 Black would be in big trouble, but with 28.Qd6? White allows 28…Bxb3. However, Carlsen apparently was not satisfied with a draw and tested his luck one more time with 28…Ne8?!. Even though 29.Qa3 is still much better for White, Giri chose to force Carlsen to execute a drawing combination: 29.Qa6? Bxb3! 30.Qxf6 Nexf6 31.axb3 Rxb3 32.Rc2 Rb1 33.Ka2 R1b4 34.Ka2. Replay the game with Chess King, watch the post-game comments by both the players, and read a final-round report on Chess Blog. World No. 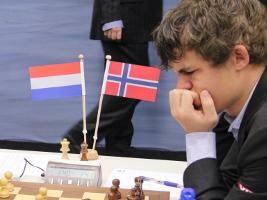 1 Magnus Carlsen has won the 75th edition of the Tata Steel Chess 2013 in Round 12 – with a round to spare. He destroyed US Chess Champion Hikaru Nakamura in an attacking game that left Nakamura struggling for breath. Replay the game with Chess King, watch post-game video comment by Carlsen, analysis video of the game with Carlsen, and read a report on the games of Round 12 at Chess Blog. Do you know why Ivan Sokolov resigned in this position after Sergey Karjakin played 32.Bc2 in Round 11 at the 75th Tata Steel Chess 2013? 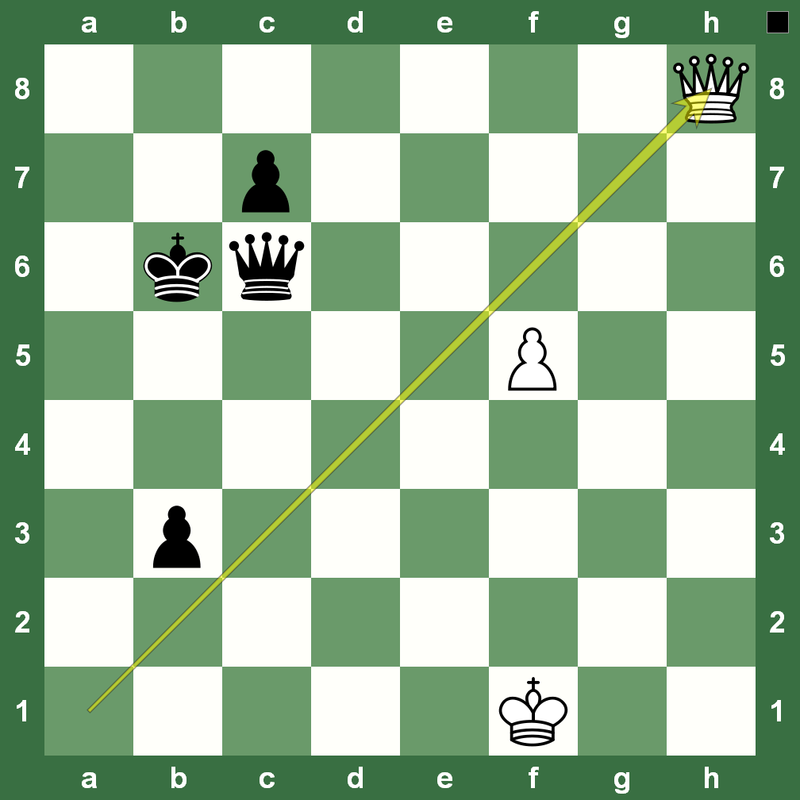 Yes, because the Black Queen is trapped with the next move Bd1! Moving the Knight on g6 is not an option as it would be checkmate on g7. 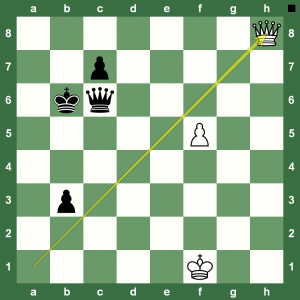 The only way Black can save the Queen is by moving out the Black Bishop on h4, but to where? Replay the game with Chess King, watch the post-game video, and read a full report on Round 11 at Chess Blog. 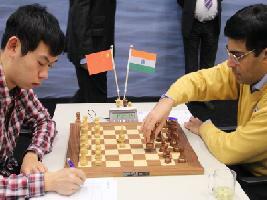 Round 11 at the 75th Tata Steel Chess 2013: World Champion Anand dropped the ball against former Women’s World Champion Hou Yifan. What seemed destined to become a model endgame victory turned tragic for the Indian Grandmaster when he decided to transpose a winning knight endgame into a drawn pawn endgame: After, for example, 42…h5 Black should be winning, but after Anand’s mistake 42…Nf5?, Hou Yifan found the narrow path to a draw with 43.Nxf5 Kxf5 44.a4 Ke6 45.g4! Kd5 46.Kc3 Ke4 47.Kc2! Kd4 48.Kb3 e4 49.b5 axb5 50.axb5 e3 51.Kc2 Ke4 52.Kd1!. Replay the game with Chess King, watch the Hou Yifan’s post-game video comment, and read a full report on Round 11 at Chess Blog. Despite at slow start to the 75th Tata Steel Chess 2013 for Levon Aronian, the nice win over US Chess Champion Hikaru Nakamura has put the Armenian GM and Olympiad champion in second place after Rond 11. Aronian is just one point behind tournament leader Magnus Carlsen. Two more rounds are to be played. Replay the game with Chess King, watch the post-game video, and read the Round 11 report on Chess Blog. In round 10 of the Tata Steel Chess Tournament Magnus Carlsen increased his lead to 1,5 points by defeating Erwin l’Ami in a hard-fought Caro Kann. l’Ami threw up a barricade early on and toughly defended for many hours, only to falter in the final hour of play! Replay the game with Chess King, watch the post-game video comment, and read a full report about Round 10 at Chess Blog. 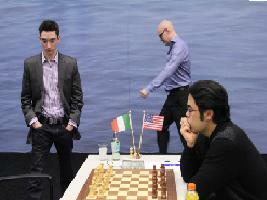 Ivan Sokolov ran into a well-prepared Peter Leko in Round 10 at the 75th Tata Steel Chess Tournament 2013. Leko opted for the Nimzo Indian against Nimzo expert Sokolov. At the 2012 Olympiad Leko had suffered a painful defeat at the hands of Arkadij Naiditsch in the same line that appeared on the board, and found the novelty 15…Nh5! in his preparation of the FIDE Grand Prix Tashkent in November of last year. Instead of defending a slightly worse position, Sokolov tried to punish Black’s weakening of the b1-h7 diagonal with 16.Qc2, but was struck by the killer 16…g6 17.Rxe6 Nf4! winning an exchange, as for example after 18.Bxe7 Nxe7 19.Re3 Nf5 20.Re4 Black has the crushing 20…Nxg2! 21.Kxg2 Nxd4. Once the White attack had run out of steam, Leko took over the initiative and won quickly. Replay the game with Chess King, watch the post-game video comment and read a full report on Round 10 at Chess Blog. 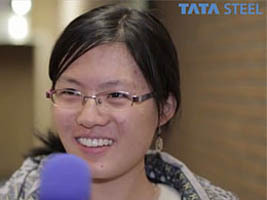 Former Women’s World Chess Champion Hou Yifan scored her second victory at the 75th Tata Steel Chess Tournament 2013 in Round 10. Playing solidly with Black she handled the Rook ending with confidence to hand Indian Grandmaster Pentala Harikrishna his second defeat in the tournament. Replay the brave game with Chess King, watch the post-game video and read a full report on Round 10 at Chess Blog. 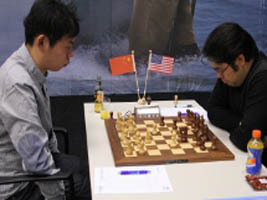 US Chess Champion Hikaru Nakamura moved up to second place in Round 10 at the 75th Tata Steel Chess Tournament 2013 after a nice victory over Italian talent Fabiano Caruana. Nakamura came prepared with a surprise and Fabiano was confused soon enough. Utilizing his bishop pair, Nakamura kept leaning on White’s position until finally Caruana slipped up, allowing a venomous tactic: 54…g4! 55.hxg4 h3! and White is lost on account of 56.gxh3 Rf8! 57.Kd3 Rf4 and Black wins a piece due to the threat of 58…Bxe4. Replay the game with Chess King, watch the post-game video comment and read a full report on Round 10 at Chess Blog. This position is from the game Hou Yifan – Magnus Carlsen in Round 9 at the 75th Tata Steel Chess 2013. 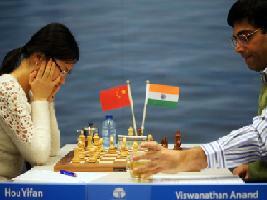 The former women’s world chess champion put up a spirited fight against the World No. 1. Can you win this position as Black from here on? Replay the full game with Chess King, watch the post-game video and read a full report on Round 9 at Chess Blog. By the time you read this, GM Gawain Jones’ comment “Carlsen draws blood out of stone” would have already gone viral on the Internet. Jones would know. He dared sac his Queen against Magnus Carlsen at the London Chess Classic 2012 a few weeks back! 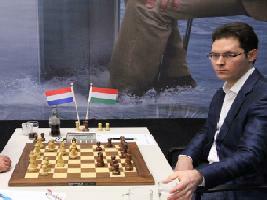 The highlight of Round 8 at the 75th Tata Steel Chess 2013 was Magnus Carlsen’s win against Sergey Karjakin. 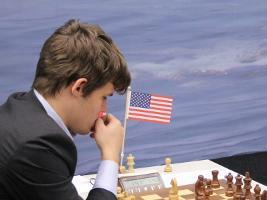 The critical moment occurred at move 67, when Carlsen decided to force matters with 67.g4!? hxg4 68.h5. Karjakin fell for the bluff with 68…Rh1?, where he could have a draw after 68…gxh5 69.f5 h4 70.f6 Kg6 71.Rxf8 Kf5! and black will force a perpetual check, for example: 72.Rh8 g3 72.Ke1 g3 74.Kf1 Rb1 75.Kg2 Rb2. Replay the game with Chess King, watch the post-game video comment by Carlsen and read a report on Round 8 at Chess Blog. 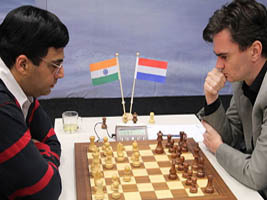 75th Tata Steel Chess 2013 Round 7: Loek van Wely went for the Scandinavian Defense against Viswanathan Anand, but blundered in a very difficult position on move 35 and the game was over. Although the Dutchman achieved an adequate position on the black side of a Scandinavian Defence, his attempt to break free was ill-timed costing him first a pawn and then the game after 23.Qb1, the move Van Wely had missed in his calculations. Replay the game with Chess King, watch the post-game video and read a full account of Round 7 at the tournament at Chess Blog. 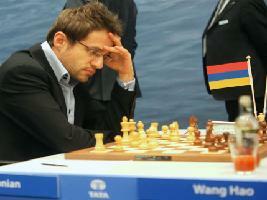 Levon Aronian was back to his winning ways and beat Peter Leko in the Queen’s Indian Defense. 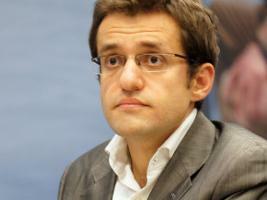 Aronian held on patiently and prevented his opponent from steering the game to a draw. Watch the post-game video comment, run the game through Chess King and a full report on Round 6 is available at Chess Blog. The former women’s world chess champion finally got to score her first win at the 75th edition of the Tata Steel Chess in Round 6. 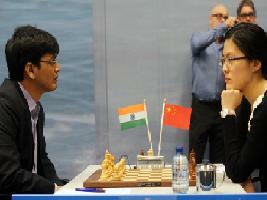 Hou Yifan knew how to exploit her chances on the queenside as Giri ambled along planless. An exchange sacrifice set the Chinese GM on her path to victory and even the return sac was not enough to save the game for Giri. Watch the post-game video and run the game through Chess King. A round report is available at Chess Blog.